A PTO at the rear end of a farm tractor. 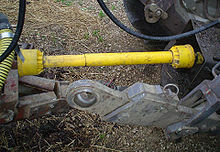 A PTO (in the box at the bottom) in between the three-point hitch of a tractor. Most commonly, it is a splined drive shaft installed on a tractor or truck allowing implements with mating fittings to be powered directly by the engine. Semi-permanently mounted power take-offs can also be found on industrial and marine engines. These applications typically use a drive shaft and bolted joint to transmit power to a secondary implement or accessory. In the case of a marine application, such shafts may be used to power fire pumps. Various power transmission methods were available before power takeoffs became common, but there were applications left wanting for some of the attributes that PTOs would provide. Flat belts generally lent themselves only to applications where the engine was stationary, such as factory steam engines, portable stationary engines, or traction engines parked in front of the work. For moving vehicles such as a traction engine or early tractor towing a farm implement, the implement could receive rotary power by taking it from one of its own wheels (whose turning was imparted by the towing) and distributing it via roller chains (to a sickle bar's crank, for example), but such a transmission ceases if the vehicle stops traveling; and the workload's resistance tends to make the wheel skid rather than turn, even if cleated. The concept of a shaft drive with easily connected and disconnected couplings, and flexibility for driving at changing angles (such as when an articulated tractor-and-trailer combination turns), was a goal to pursue. Experimental power take-offs were tried as early as 1878, and various homemade versions arose over the subsequent decades. International Harvester Company (IHC) was first to market with a PTO on a production tractor, with its model 8-16, introduced in 1918. Edward A. Johnston, an IHC engineer, had been impressed by a homemade PTO that he saw in France about a decade before, improvised by a French farmer and mechanic surnamed Gougis. He and his IHC colleagues incorporated the idea into the 8-16, and designed a family of implements to take advantage of the feature. IHC was not alone in the market for long, as within a year PTOs were appearing on other production tractors, such as some Case models. In 1920, IHC offered the PTO option on their 15-30 tractor, and it was the first PTO-equipped tractor to be submitted for a Nebraska tractor test. The PTO was a competitive advantage for IHC in the 1920s, and other companies eventually caught up with PTO implementation. Inside the transmission, the exact point along the gear train where the power is taken off determines whether the PTO can be run independently of vehicle travel (ground speed). Early PTOs were often taken off the main output shaft, meaning that the vehicle had to be "in gear" in order to run the PTO. Later this was improved by so-called live PTO (LPTO) designs, which allow control of the PTO rotation independently of the tractor motion. This is an advantage when the load driven by the PTO requires the tractor motion to slow or stop running to allow the PTO driven equipment to catch up. It also allows operations where the tractor remains parked, such as silo-filling or unloading a manure spreader to a pile or lagoon rather than across a field. In 1945, Cockshutt Farm Equipment Ltd of Brantford, Ontario, Canada, introduced the Cockshutt Model 30 tractor with LPTO. Most PTOs built today are live. In modern tractors, LPTO is often controlled by push-button or selector switch. This increases safety of operators who need to get close to the PTO shaft. Some implements employ light free-spinning protective plastic guards to enshroud the PTO shaft, and are mandatory in some countries. In the UK, Health and Safety Executive guidance is contained in a leaflet. ISO 500-3 Main PTO dimensions and spline dimensions, location of PTO. The original type calls for operation at 540 revolutions per minute (RPM). A shaft that rotates at 540 rpm has 6 splines on it, and a diameter of 1​3⁄8". Two newer types, supporting higher power applications, operate at 1000 RPM and differ in shaft size. The larger shaft has 20 splines (1​3⁄4" diameter), while the smaller has 21 (1​3⁄8" diameter). All three types rotate counterclockwise when viewed from the tractor (When standing behind the tractor, the shaft turns clockwise). A 10 spline type was used with some early equipment such as the 1948 Land Rover, a six spline adapter was usually supplied. It is customary for agricultural machines manufacturers to provide the nominal PTO power specification, an indication of the available instantaneous power at the shaft. Newer tractors may come equipped with 540/540E and/or 1000/1000E options that allow the tractor to power certain low-power-demand implements like hay rakes or tedders using lower engine speeds to maintain the revolutions per minute needed, using less fuel and placing less stress on the engine thereby improving efficiency and reducing costs. The first industry standard for PTO design was adopted by ASAE (the American Society of Agricultural Engineers) in April 1927. The PTO rotational speed was specified as 536 ± 10 rpm; the direction was clockwise. The speed was later changed to 540 rpm. Truck transmissions have one or more locations which allow for a PTO to be mounted. The PTO must be purchased separately and care is required to match the physical interface of the transmission with a compatible PTO. PTO suppliers will usually require details of the make, model and even serial number of the transmission. Care is also needed to ensure that the physical space around the transmission allows for installation of the PTO. The PTO is engaged/disengaged using the main transmission clutch and a remote control mechanism which operates on the PTO itself. Typically an air valve is used to engage the PTO, but a mechanical linkage, electric or hydraulic mechanism are also options. Most Unimogs come with front and/or rear PTOs and hydraulics as well as three point hitch systems. Units will be rated according to the continuous and intermittent torque that can be applied through them and different models will offer different "PTO shaft rotation to engine RPM" ratios. The axle-facing shaft which transmit the propelling power to the axle. The unit itself is designed to independently divert the engine's power to either the axle-facing shaft or the additional PTO output shaft. This is done by two independent clutches like tooth or dog clutches which can be operated at total driveline standstill, only. Since the main gearbox changes the rotation speed by selection of a gear the PTO cannot be operated during driving. The vehicle needs to be stationary for operation therefore. On 4x4 vehicles only the rear drive shaft is used by the split shaft PTO gearbox requiring the vehicles 4x4 drive scheme to be of the selectable 4WD type to keep the front axle drive shaft completely decoupled during PTO operation. 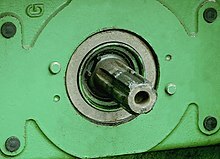 It is also possible to connect something other than a hydraulic pump directly to the PTO for example, fire truck pumps. A "Sandwich" type split shaft unit is mounted between engine and transmission and used on road maintenance vehicles, fire fighting vehicles and off-road vehicles. This unit gets the drive directly from the engine shaft and can be capable of delivering up to the complete engine power to the PTO. Usually these units come with their own lubricating system. Due to the sandwich mounting style the gearbox will be moved away from the engine requiring the driveline to accommodate the installation. ^ a b Pripps & Morland 1993, pp. 37–39. ^ "Examiner: Fidrych suffocated to death". ESPN.com. 16 April 2009. Retrieved 7 January 2014. ^ Tinc, Pamela J.; Sorensen, Julie A. (2019-01-02). "Marketing Farm Safety: Using Principles of Influence to Increase PTO Shielding". Journal of Agromedicine. 24 (1): 101–109. doi:10.1080/1059924X.2018.1539421. ISSN 1059-924X. PMC 6353692. PMID 30346257. ^ "Power take-offs and power take-off drive shafts" (PDF). Health and Safety Executive UK. Retrieved 29 October 2018. ^ "PTO Air Compressors | Direct-Transmission™ Mounted Air Compressor". VMAC. Retrieved 2018-12-11. Wikimedia Commons has media related to Power take-offs.